With only 24 weeks to go until the final matric exams commence, CUT held an open day to encourage parents schools to bring their children to CUT next year. These learners from across the central region came in huge numbers to explore CUT’s campuses in Bloemfontein and Welkom on 10 and 11 May 2013. 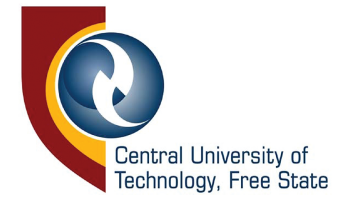 The four faculties at the university, including Engineering and Information Technology, Health and Environmental Sciences, Humanities, and Faculty of Management Sciences, all opened their facilities to school learners, teachers and parents to experience breadth and depth of the academic offerings at CUT and the practical academic excellence that can be expected, with demonstrations and general information about programmes offered at CUT. “We prepare you for the world of work, creating employable and work-ready graduates” said Prof Linda de Jager, Dean of the Faculty of Health and Environmental Sciences who in 2012 had an average pass rate of 85%. CUT’s feeder schools also attended the Open Day. The Feeder School Bursary Programme, in partnership with high schools in the central region was established in 2010 with the purpose to assist learners who persistently perform well in science, engineering and technology to study at CUT. “We develop future leaders that excel in industry and business across the globe”, said Prof Albert Strydom, Dean of the Faculty of Management Sciences, CUT’s largest faculty. “All our lecturers consult with professionals and are sent to industry to interact with new trends, which are regularly incorporated into the course content”. Dean of Humanities, Prof David Ngidi, said that the faculty had a 77% average pass rate in 2012 and that CUT’s process of reviewing learning programme to deliver market related courses for prospective students which are fairly unique in the industry. “Very soon we will not teach you to simply be a photographer, but you will become a graphic designer/photographer/jewellery designer all in one – giving students what they need in today’s world – multiple skill sets – employability.” stated Ngidi. The learners were also surprised by a visit and performance by multi-award winning, internationally renowned and platinum selling R&B singer Loyiso Bala. “When I see students, I see the future and the future is bright”, said Bala in his address to the learners. The purpose of the Open Days was to allow potential students the freedom to explore CUT’s facilities and see what programmes are available to them beyond the generally known professions – opening their young minds to new possibilities.